I hope everyone had a Merry Christmas filled with lots of love and time spent with family and friends! 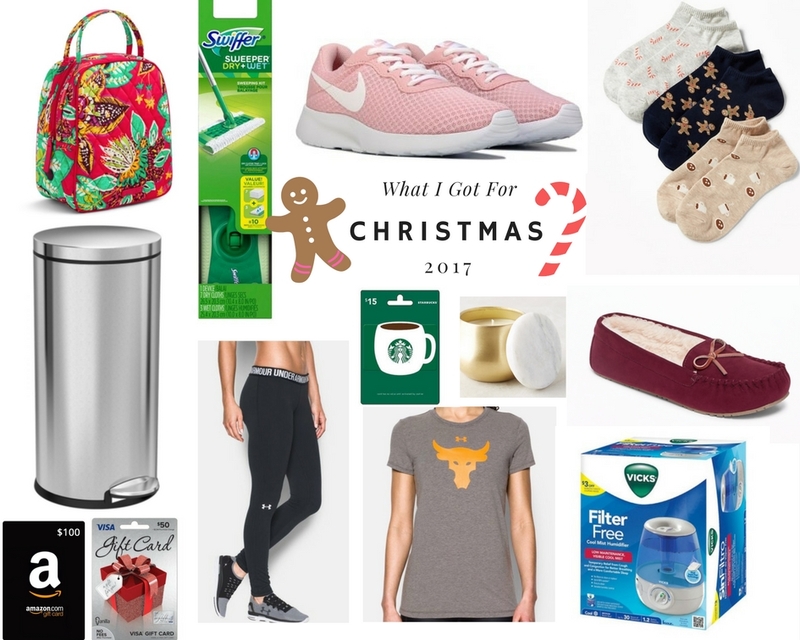 Over the past few days, I have seen quite a few bloggers post about what they received for Christmas and I really enjoyed reading them (because I'm nosey like that LOL) so I thought I would share what I received this year as well! This Christmas was the year of #adulting... I asked for things that we needed for our new house and just things I needed for everyday life. My in-laws were so sweet and got me the Swiffer I requested along with a humidifier, and a giant box of K-cups for my Keurig. My sister-in-law got me this adorable Vera Bradley lunch box for work and my brother-in-law got me a super sleek trash can for our kitchen! (Is it lame that I got really excited about a trashcan?!) My sister got me my favorite candle from Anthropologie and my parents got Joe and I shutters for our house! From my husband, Joe, I received adorable pink Nike sneakers, fluffy slippers, socks, Under Armour leggings and a Project Rock tee from Under Armour so I can match him! I also received lots of gift cards and other goodies that I am so thankful for. Most of all I am thankful that Joe had the day off of work and that for the first time in 5 years he was able to be home for Christmas! I love the slippers you linked. Unfortunately, the slippers are sold out in my size. Have you seen anything else that's similar?